Mission Objective: "First and fore most, I need a partner. I am preparing to compete in the famous Man Versus Food challenge like what I've been doing the past year but the event got even bigger this time around. I haven't won any challenge but I'm planning to this year. I need a partner with huge appetite to take down the 12 lbs Platter of Burrito God. So who likes burritos?" Personality: A gleeful man around his mid twenties, Adam is fond of eating challenges and definitely love foods. His enthusiasm is so high that he eats several times a day and has a really huge appetite. Though ever since he joined any food eating contests, he haven't won any but he still have hope and his love for food never fades. He likes food enthusiasts the most. Motivation: To win the Man Versus Food eating challenge. 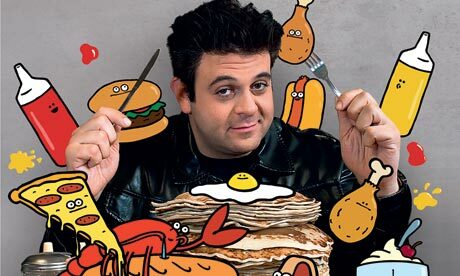 Fears: Not being able to win the Man Versus Food eating challenge. This mission is also available to Sable Pantera Mages so if someone has already taken it this will be nulled unless they/he/she failed, which will then make this available again. Spitfire, Sokuseki, and I have resigned from Staff. Any concerns or questions should be forwarded to Syrena.